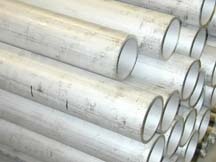 Dual-phase or duplex stainless steel whose grain structure is ferritic and austenitic. Alloy S31803 and Alloy S32205 Stainless Steel is used most often in heat exchangers, marine construction, oil and gas industry, chemical processing. Excellent general corrosion resistance; superior to Grade 316 steel in most environments. Excellent resistance to localized corrosion including inter granular, pitting and crevice corrosion; the CPT of 2205 is generally at least 35ºC. The grade is also resistant to chloride stress corrosion cracking (SCC) at temperatures of up to about 150ºC. Grade 2205 will often perform well in environments which cause premature failure of austenitic grades. It has better resistance to sea water then Grade 316. Notice: 2205 and duplex 2205 are ambiguous trade names referring to either S31803 or S32205.